Oregon’s Nearshore ecoregion offers opportunities for boating, surfing, wildlife viewing, fishing, crabbing, clamming, and recreational pursuits. It supports commercial fish harvests, shipping, and ecosystem services that benefit all Oregonians. The nearshore environment includes a variety of habitats ranging from submerged high-relief rocky reefs to broad expanses of intertidal mudflats in estuaries. It is home to a vast array of fish, invertebrates, marine mammals, birds, algae, plants, and micro-organisms. These habitats and species are integral parts of Oregon’s complex nearshore ecosystem, and are interconnected through food webs, nutrient cycling, habitat usage, and ocean currents. They are also influenced by a multitude of other biological, physical, chemical, geological, and human use factors. 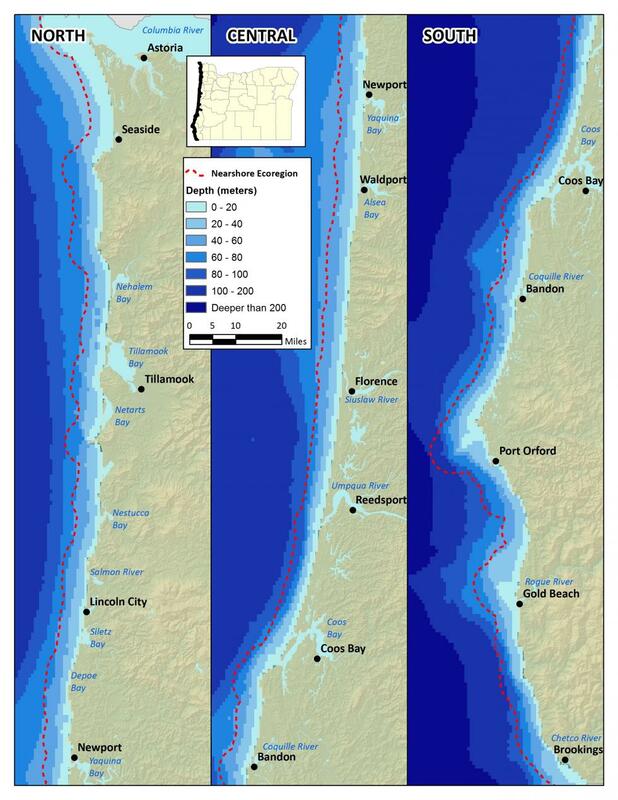 The Nearshore ecoregion encompasses the area from the outer boundary of Oregon’s Territorial Sea at 3 nautical miles to the supratidal zone affected by wave spray and overwash at extreme high tides on the ocean shoreline, and up into the portions of estuaries where species depend on the saltwater that comes in from the ocean. The Nearshore ecoregion is bordered by the Coast Range ecoregion on the ocean shores and intersects it in Oregon’s estuaries. Nearshore ocean ecology is influenced by environmental conditions in adjacent estuarine, terrestrial, and freshwater habitats. The nearshore ocean is extensively linked with the atmosphere and the dynamic offshore waters of the California Current Large Marine Ecosystem. It is heavily influenced by human coastal development and populations. The ODFW’s Marine Resources Program has updated the Oregon Nearshore Strategy to provide a comprehensive, sustainable approach to marine species and habitat management. The Nearshore Strategy addresses marine species, including saltwater fish, shellfish, marine mammals, and seabirds, and their habitats. Oregon’s ecosystem-based management approach recognizes the role human populations play as a part of ecological systems. As human activities in and around the Nearshore ecoregion increase, human impacts on the fish, wildlife, and their habitats may also increase. Of Oregon’s 33 coastal cities, 12 are active ports supporting vessel traffic to and from ocean waters, and all are an integral part of coastal ecology. Coastal development, tourism, recreation, sport and commercial fishing, dredging, wastewater disposal, aquaculture, and energy development are just a few nearshore resource uses that benefit human communities. However, along with the benefits, there are potentially adverse effects on nearshore resources. Proactive management and planning are needed to anticipate and avoid or minimize negative environmental consequences of human activities. Oregon’s nearshore environment is a public domain that is managed in trust by the State of Oregon, and as such, conservation of nearshore resources requires collaboration among a broad range of management agencies and public user groups. The state’s management of nearshore fish and wildlife resources falls mainly under the purview of the ODFW. Human use issues, such as water pollution, vessel traffic, or access to public lands, are managed by other state agencies, local governments, tribal governments, and federal entities. For more information about jurisdictional boundaries and authority within Oregon’s nearshore environment, see the “Agency Programs and Authorities in Oregon’s Nearshore Area” diagram in the Oregon Nearshore Strategy. To balance human use benefits with conservation concerns, many management actions are designed to maintain access to natural resources while preventing serious depletion or damage. Natural resource management must also account for the needs of both present and future generations, which requires taking a long-term view. To meet these goals, the Oregon Nearshore Strategy recommends 12 conservation and management priority actions. These actions address nearshore issues that are in need of immediate or timely attention, are feasible to implement given appropriate funding, and have received some level of public support. There are three general categories of action: 1) education and outreach, 2) research and monitoring, and 3) management and policy. The conservation of marine resources is the responsibility of all users, to ensure the long-term productivity of marine ecosystems. Several selected opportunities for conservation, education, research, and management based on the 12 recommendations within the Oregon Nearshore Strategy are listed below. Most marine species and habitats occur below the water’s surface and go unseen by most members of the public. Education and outreach efforts are needed to increase public awareness about nearshore marine species and habitats, as well as the issues affecting them. Improve education and outreach efforts to disseminate information on species identification and distribution, management regulations, and release techniques designed to reduce discard mortality. Develop curriculum materials and provide information to schools for use in classrooms. Continue to improve the appearance, visibility, and effectiveness of the ODFW Marine Resources Program website. Employ emerging technologies, blogs, and social media sites. Use local newspapers and literature to share research and conservation actions with adults and children. Display conservation and educational materials at hotels, charter offices, angling shops, real estate offices, malls, parks, marinas, boat ramps, beach access points, and other public areas. Encourage development of local and port groups to facilitate information and knowledge exchange between agencies and local constituents. Design and convene workshops tailored to educate the public on specific topics (e.g., fish, algae, shellfish, non-native species identification workshops). Involve members of the public in management of nearshore marine resources, conduct regular updates to the Oregon Nearshore Strategy, and ensure that management priorities are congruent with public needs. Disturbance to, or loss of, habitat important to nearshore species and ecosystems can occur from both direct and indirect sources. Disturbances to vulnerable intertidal habitats are often subtle and can be a consequence of human activities that cause light or noise pollution or result in trampling of intertidal habitats, animals, or plants. Intertidal and submerged habitats are impacted by changes to sediment transport due to altered hydrology, coastal development, shoreline armoring, beach grooming, global climate change, and many other factors. Non-native species introductions may alter physical properties and habitat-forming biological communities (e.g., crowding out native organisms that function as substrate for other organisms) in nearshore habitats. Certain bottom fishing methods may reduce structural diversity of the sea floor and change benthic communities. Continue to monitor nearshore species and habitats to document impacts that may be subtle or may accumulate over time, and to determine areas where disturbance is causing, or could cause, negative impacts to species or habitat. Collaborate with academic and management entities in the study of non-native species, survey intertidal and subtidal habitats for presence, set a baseline of habitat use, and monitor communities for potential spread. Investigate alternative methods (e.g., fishing techniques, shoreline erosion control, development practices) that reduce or remedy negative impacts on nearshore habitats. Inform the public about the use of non-disturbing methods appropriate for viewing marine wildlife. Provide new or improved interpretive signage, media inserts, feature articles and booklets about intertidal habitats, fisheries information, and other nearshore ocean resources. Water quality degradation caused by human activities or natural causes may impact nearshore species and habitats. Water quality within the nearshore ocean is affected by coastal and inland development, either from increased runoff of contaminated water or increased water temperature resulting from altered hydrology or depth (e.g., dredging, filling). Boating activity in nearshore waters or adjacent estuaries may lead to accumulation of oil in surface waters from poorly-maintained or failing equipment. Water quality may be further degraded if conditions support significant blooms of harmful algae, which can lead to highly concentrated marine biotoxins. Coordinate with the multiple state and federal agencies involved in water quality issues to update and improve signage at marinas and public beaches to inform boaters and beach users about water quality issues and methods for reporting problems. Develop incentive programs to encourage boaters to use environmentally-friendly gear or equipment. Prevent contamination and enforce laws regarding pollution and water quality issues. Monitor for harmful algal blooms to diagnose potential indications of domoic acid or paralytic shellfish poisoning. Populations of nearshore species may be impacted by commercial or recreational overharvest at local or at broader scales, as well as through bycatch and discard of non-targeted species. Accurate accounting of stock abundance and harvest impacts is an important component of sustainable resource management. Abundance estimates and complete life history information remain unknown for many nearshore species. Provide opportunities for protecting and enhancing nearshore fisheries stocks. Develop and implement fish release methods designed to minimize discard mortality. Increase ODFW representation at sportsmen shows, festivals, and other venues, encourage fishers to avoid vulnerable species, and make information about proper discard techniques widely available. Develop monitoring, conservation, resource analyses, and harvest management plans for commercially and recreationally harvested shellfish. Evaluate immediate and long-term conservation and harvest management needs for Oregon’s recreational and commercial nearshore fisheries. Develop stock assessment and/or stock status indicator strategies for priority nearshore groundfish and shellfish species, designed to accommodate the unique circumstances and habitats of nearshore species with the greatest management need. Develop fishery-independent survey methodologies and gather baseline information for all key nearshore species. Review the Strategy Species list to identify priority species in need of conservation plans under Oregon’s Native Fish Conservation Policy. Collaborate with sport and commercial fishermen, university researchers, and others to gather imperative information for exploited nearshore stocks. Sponsor socioeconomic analysis of coastal communities to determine the relationship between stock status and direct (e.g., fishing) or indirect (e.g., tourism) impacts from various industries. Monitoring species and habitat changes will help evaluate resource status and trends over the long-term. Although some monitoring is done at present, more is needed to examine changes and trends within Oregon’s nearshore ecosystem. More data are needed to understand local and regional ecological changes due to predator-prey population dynamics, the introduction of non-native species, algae blooms, climate change, and ocean acidification effects and other changes. Many aspects of Oregon’s nearshore habitats and species are poorly understood. For many marine species, substantial data gaps exist with regards to population structure, life history parameters, response to environmental change, and species-habitat associations. Similarly, while significant strides have been made toward describing and mapping nearshore habitats, gaps remain for parts of the nearshore area. In addition, researchers are still accumulating data to describe the physical properties and biological component of certain habitat types, and to provide long-term information on the physical response of nearshore systems to climate change. More information is needed to assess and understand the complexity of the nearshore ecosystem and the effects of human interactions. Encourage and assist in monitoring the population dynamics and habitat usage of rocky reef-associated species. Research the movement, behavior, and predator-prey relationships of adult and juvenile stages of nearshore species. Identify and evaluate conflicts between marine mammals and fisheries. Inventory and monitor non-native species. Public users should inspect boats, clothing, and equipment for non-native species before and after use of natural areas or waterbodies, and should report sightings to support ongoing monitoring of species distribution. Assess and gather baseline information on levels of human use and disturbances to intertidal habitats, animals, and plants. Review coastal development plans and regulations to identify opportunities to address areas with consequent negative impacts to nearshore resources. Improve and expand the capabilities of research and monitoring programs to meet the requirements of the Native Fish Conservation Policy and other nearshore resource management programs. Investigate the effects of environmental changes on nearshore species and habitats. Continue to study, evaluate, and monitor harmful algal blooms to provide an early warning system for blooms. Continue to develop non-lethal habitat surveys of nearshore habitats, and collaborate with interested stakeholders to increase survey coverage. Estuaries are essential habitat for certain life stages of many recreationally and commercially important marine species. Estuaries are linked to the nearshore ocean through the movement of water, nutrients, sediments, animals, and plants, as well as human activities. Estuarine habitat and species are made especially vulnerable to human-induced environmental changes due to their proximity to human activity. While some aspects of estuarine resources are described elsewhere in the Oregon Conservation Strategy, planning and information regarding the marine components of Oregon’s estuaries and the marine-estuarine connection are needed. Develop and implement science-based management strategies for estuarine resources. Develop key strategic plans under the guidance of the Native Fish Conservation Policy for estuarine species with the greatest need. Develop conservation and harvest management plans for commercially and recreationally harvested shellfish. Expand upon management objectives previously identified, and further develop plans that identify restoration or conservation targets for individual estuaries. Encourage and assist in estuarine research to identify data and knowledge needed for management planning. Oregon’s nearshore environment is public domain, and opportunities for public participation in conservation and management of nearshore resources are present throughout the entire Nearshore ecoregion. For the other eight ecoregions, Conservation Opportunity Areas (COAs) were developed to guide voluntary, non-regulatory actions to benefit habitats where broad fish and wildlife conservation goals could be best met. Although conservation actions to benefit Strategy Species and Habitats are important regardless of location, focusing investments in certain priority areas can improve funding efficiency and promote cooperative efforts across management areas. For the eight terrestrial ecoregions, COAs were selected using extensive data analysis, spatial modeling, and a MARXAN analysis with specific goals for many of the Strategy Species and Habitats (see COA methodology). However, the COA analyses did not include most of the spatial area of the Nearshore ecoregion, its Strategy Species, or Habitats because data were insufficient to support this approach. Although 23 COAs identified in the Coast Range ecoregion include estuarine and/or ocean shoreline areas that are part of the Nearshore Ecoregion, those COAs are not listed in this section as the methodology and analyses were not designed to address all of the Nearshore Strategy Species and Habitats. Designation of specific COAs in the Nearshore ecoregion may be considered in the future as more information on the distribution of species, habitats, and other needed information becomes available. Locations of potential conservation areas would only be established following opportunities for public involvement in the development process.